The date was one of the earliest cultivated crops in the Middle East. It is believed to have been first cultivated in Eridu in Mesopotamia or along the Nile Valley in Egypt. In fact, the date palm became an emblem of Upper Egypt due to its supposed sacredness to the sun god Re. It was also found in Eastern Arabia around 4000 BCE. These ancient cultures also linked the date with fertility. 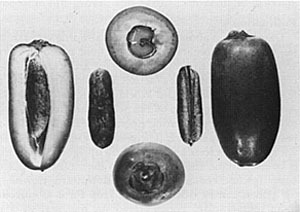 Later on, the Romans used more than the fruit itself; they liked to use the date palm tree as a decorative motif in mosaics. From the Roman Empire, the use of date palm trees as graceful decorations spread to the Byzantine Empire. Due to the Moors, the date diffused into Europe through Spain during the Al-Andalus period. namesake) is known for its date palm trees! The date palm is featured as a symbol on the Saudi Arabian royal emblem, showing the cultural significance to this central Middle Eastern country. In the Arab world, the date is more than just a fruit as well; it can be pressed into cakes, used as food for animals, or crushed to make spreads. 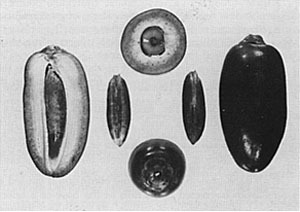 Date stones (found inside the fruit) can be crushed and mixed with flour to create a nutty-tasting bread. In the Arabian Peninsula, dates are often paired with coffee because they contrast with its bitter flavor. Syrups made from dates are popular. Dates stuffed with marzipan or walnuts act as popular desserts in the eastern Mediterranean region. The date had important significance for people in the Middle East who had a nomadic lifestyle. Its long life when dried and its high nutritive value made the date a perfect food for people who had to move around to support their livelihood. Another use for the date palm tree is wood for building. The wood does well in dry climates—another aspect that works well with the MENA region. In Arab markets today, especially in Saudi Arabia, one can find carved palm wood from old houses. Palm fronds can be used for making baskets and thatching roofs. Basra, Iraq in 1913 and is known for its fruit with thick, flavorful flesh. The “Deglet Noor” date is found mostly in Algeria and Tunisia and was introduced to California in 1900. It is not as sweet as “Bahri” dates. “Zahdi” date is the oldest-known variety and is consumed throughout the Middle East. The “Zadhi” date was also introduced to California in 1900 and is a very sugary variety. Date palms require full sun, making parts of the MENA region perfect for growing dates. They can grow in warm climates in which the temperature doesn’t drop below 20ºF. Date palms can even tolerate long periods of drought, which also makes them great for growth in the Middle East. Date seedlings take about 6 to 10 years to fruit. 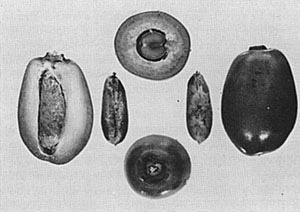 They develop in four stages, each known by a different word in Arabic: kimri (unripe), khlal (full-size, crunchy), rutab (ripe, soft), and tamr (ripe, sun-dried). Although dates are very popular in the middle east…they are becoming more and more popular in the states. Checking Google trends shows a steep inlcine for the term Medjool Dates. They are a versatile fruit for sure.